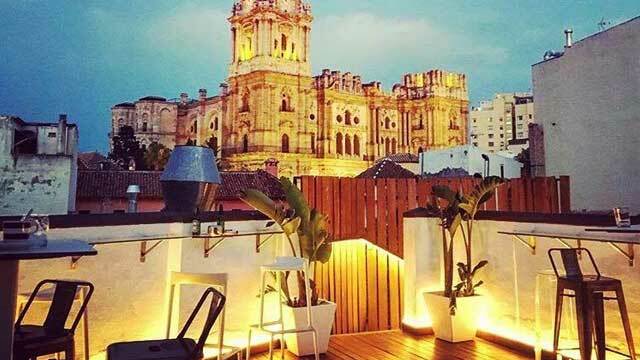 A complete guide to the 9 best rooftop bars in Malaga in 2019. 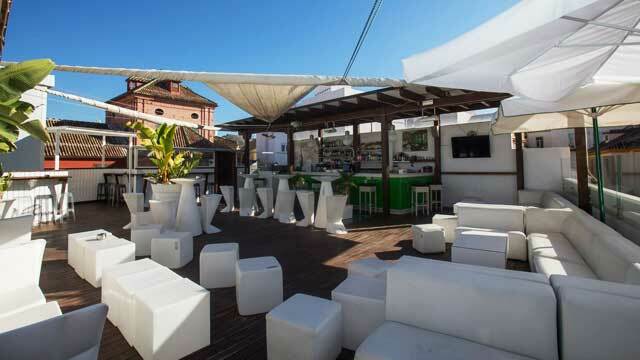 Here you'll find the best Malaga rooftop bars with all info you need about each place. Dress code, maps, view spots, pics and much more. Known as the capital of Costa del Sol with about 300 sunny days a year, this really is one of the best spots in Europe for rooftop terraces. 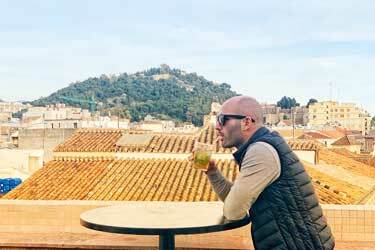 So, which is the best rooftop bar in Malaga? There are some aboslutely amazing ones here, with relaxed coast line atmosphere, rooftop pools and views of both the city and the Mediterranean. 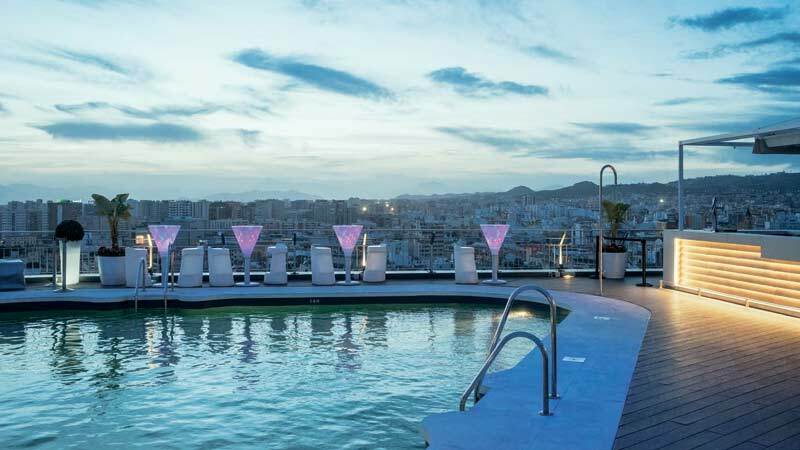 Just scroll down and find the Malaga rooftop bar best suited for you. Or use the Malaga rooftop map in the bottom right corner. 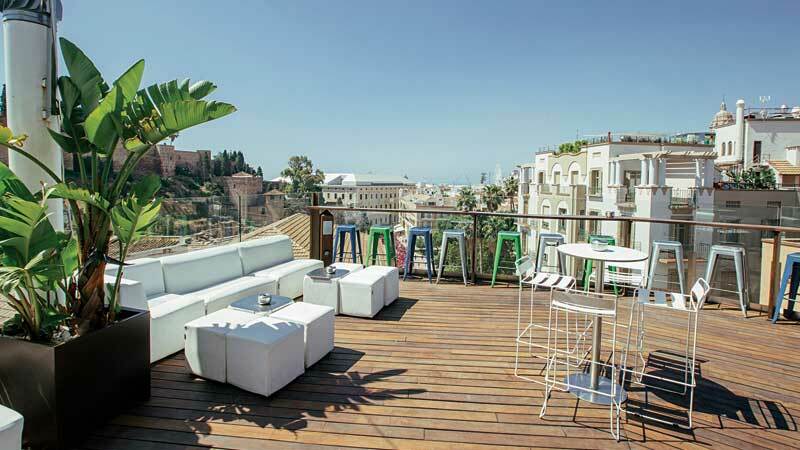 Located at the amazing Hotel Molina Lario, the Top is one of the top terraces in Malaga. Or actually two terraces, as there is one on the 6th floor and one up on the 8th, combining panoramic views over the mountains, the Catherdral and the Mediterranean. An ideal place for both after work, refreshing cocktails in the all day sun, tapas or more late night party, the rooftop bar is famous for it’s creative and delicious cocktails, and it even has its own 'Cocktail Corner'. 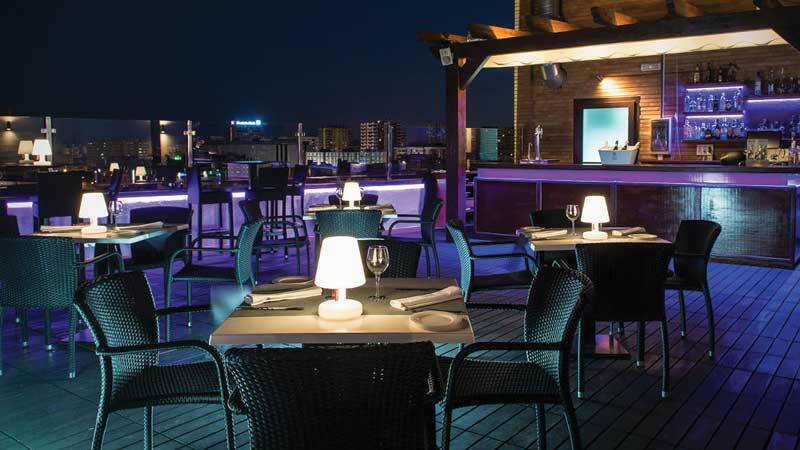 The rooftop bar at the excellent AC Hotel Malaga Palacio, called Àtico Bar & Restaurant, is one of the oldest in the city. Perched on the 15th floor, you get an incredible view over the city, harbor and the Mediterranean Sea. One of the best views in the city. Both stylish indoor restaurant with panoramic windows and lovely open-air terrace, one of the best things about this rooftop is that its open all day long. You can have your lunch, cocktails, fine dinner or apertifs here. 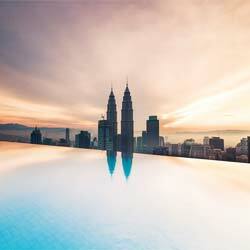 A classic and relaxed rooftop bar, located on top of Oasis Backpackers' Hostel. So, you can expect a crowd of people in the younger ages from all over the world. Most of them looking for a great night out, with good prices on drinks and a live DJ keeping the vibe high. For more relaxed cocktails, you should come here during afternoon. The rooftop bar serves a wide range of different and well-crafted cocktails, especially Gin & Tonics, which they are very famous for. Larios Terrace, on top of the excellent Room Mate Larios Hotel, is located at the busy and famous Marchues de Larios Street. 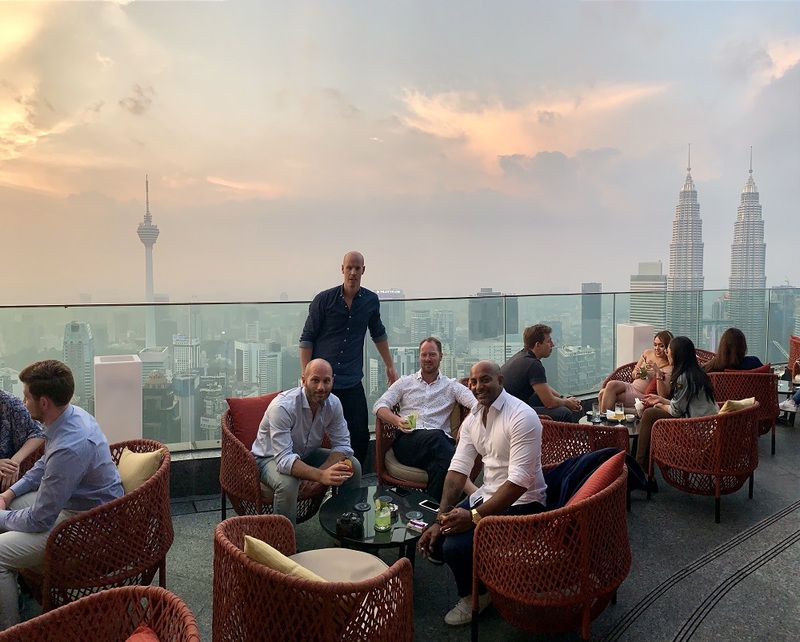 The best features this rooftop bar has to offer is location, the open air feel and some very cozy and comfortable lounge sofas. Oh, and panoramic views over the cathedral and the city rooftops. Enjoy classic and well made cocktails from the rooftop bar and live DJs, various parties and fashion shows when summer evening turns to night. A really lovely and happening rooftop terrace, home of the Picasso Restaurant & Bar, a beautiful rooftop pool, but still maybe most famous for all the great, intimate concerts being held up here during summer, called 'Live the Roof'. 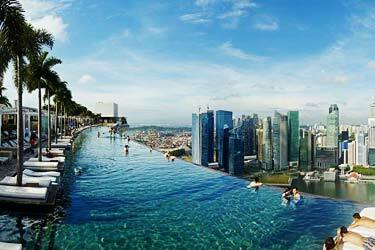 As a hotel guest you can attend all the concerts for free, as well as use the fantastic rooftop pool. 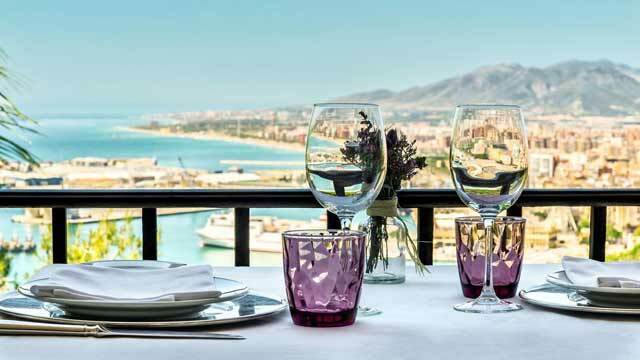 But all are welcome to visit the great Picasso Restaurant & Bar and enjoy panoramic views over Malaga, fine Mediterranean cuisine for lunch and dinner, or lighter bites and tasty cocktails. 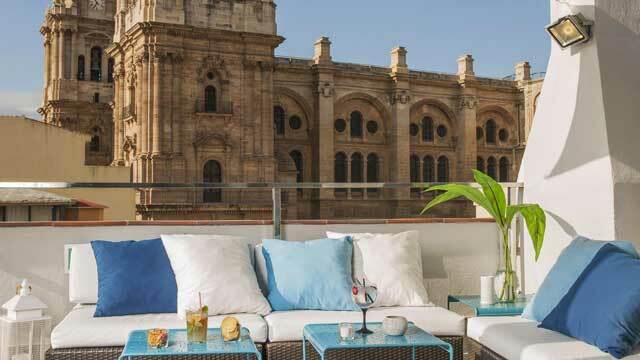 The terrace at Alcazaba Premium Hostel Málaga is one of the newest hot spots in the city. You’ll get sweeping city views from here, along with some really cool close ups of the Alcazaba and Gibralfaro castles. Best time to visit is during sunset. Mostly because of the beautiful vistas, but also because the terrace is not that crowded earlier in the evening. Friendly, fun and casual in vibe, the rooftop bar serves great cocktails to very reasonable prices. If you are hungry, just go one floor down to the great restaurant called Batik. 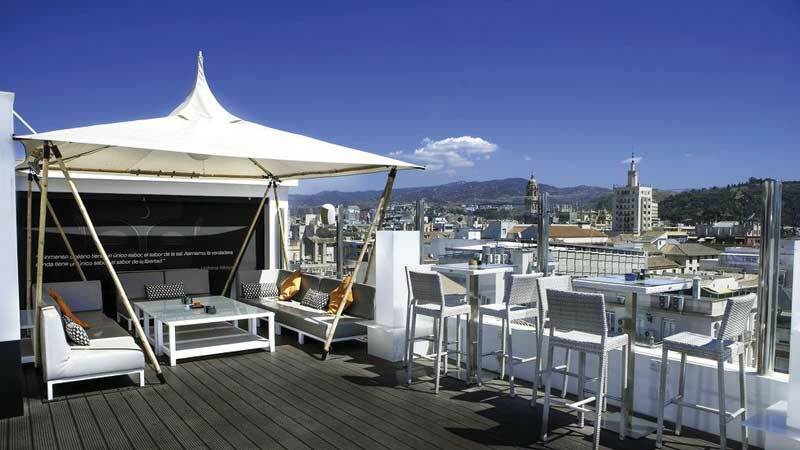 This lovely and open-air rooftop bar is perched on top of the modern boutique Hotel Soho Bahía Málaga. The modern feel of the hotel is also reflected on the terrace, with stylish lounge furniture and a classy looking bar. Quite large and perched ont the highest building in the area, the views you get are incredible. Panoramics over large parts of the city and glimpses of the ocean. Open nightly, the rooftop bar serves refreshing cocktails along with tasty snacks. Parador de Gibralfaro is both a nice hotel and a fine rooftop bar and restaurant, located on Mount Gibralfaro, a couple of minutes outside the Malaga city center. Only two floors up, but with great hillside help, the rooftop terrace offers beautiful views over the Mediterranean Sea and the city skyline. Perfect to visit both during daytime for a sunny lunch, and by night you can’t find a more romantic setting than this in Malaga. Enjoy Spanish and Mediterranean dishes with a traditional touch. Terraza Chinitas is a quite new, but already classic and popular place among the rooftop bars in Malaga. The rooftop is located right in the middle of town, among small corridor of streets and old traditional stores. Four floors up, you have to walk the stairs to get to this intimate and relaxed terrace. But it's worth it to enjoy nice music, great and casual vibes and wallet-friendly cocktails to the views of downtown Malaga and the Cathedral. Discover the biggest collection of Malaga activities, guided tours and skip-the-line tickets. Anything you want you'll find right here. Best cocktails in Malaga! Review of The TOP at Molina Lario. 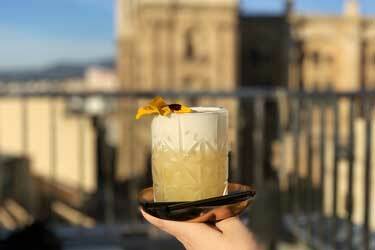 With about 300 sunny days per year, Malaga is really a city made for rooftop bars. And they make the most of it, there is alot of great terraces to chose from around the city. Most of them with a classic "costal feel", meaning quite simple decor with white lounge furniture and then letting the sun do the rest of the decoration. Malaga is not a city filled with sky scrapers, so most of the rooftops are around the fifth floor or so. Some have a rooftop pool and are open through out the day, and almost all of them are open quite late into the night. 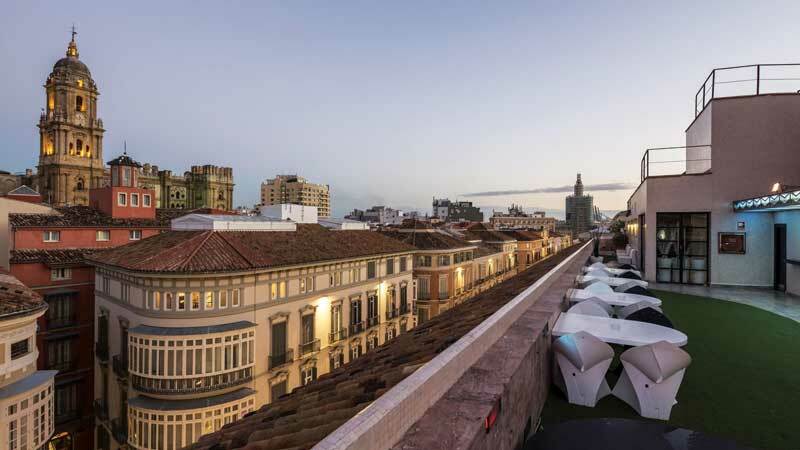 Which are the best rooftops in Malaga? 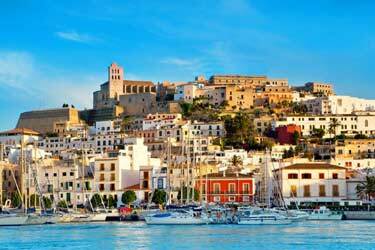 You can find a complete guide about Malaga here. 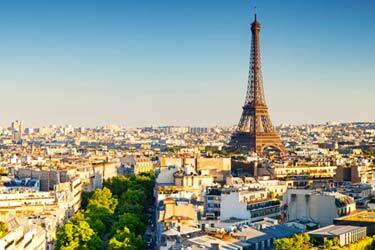 All you need the get most out of your visit in this beautiful city. Malaga is one of the oldest cities in the world, situated on the Mediterranean coast in Andalusia in Spain. 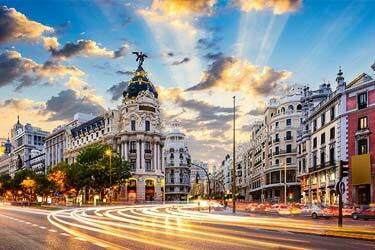 It is the sixth largest city in the country. Being such an old city the historical city center offers alot of sights telling stories of old times. 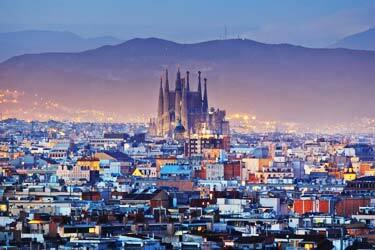 Among the most famous are the Castle of Gibralfaro and the Alcazaba. The most famous person from the city is probably the artist Pablo Picasso, who of course has his own museum.